DW's relentless pursuit of drum perfection has given the drum community countless varieties of drums and shell types that serve multitudes of musical situations. Their constant evolution forges new paths of shells and sounds spanning a myriad of materials that would pacify the most discerning of players. Enter the solid aluminum snare drum from DW. While aluminum is not new to drums, DW's take brings a new sound offering to the Collectors Series. Starting with a 3mm shell, DW's beadless shell drum has a matte-black powder-coated finish that’s reminiscent of the infamous Allot Classic while being complemented by the mirror-like chrome hardware. This snare is designed to be a “workhorse,” making it useful for live or recording playing situations. The aluminum lends itself to a crisp and sensitive articulation in the medium and high tensions while retaining definition in the lower ranges. DW's True Pitch tension rods combined with the 10 lug configuration affords the player greater control over the tuning to a very granular level. The DW Solid Aluminum snare drum recreates the Alloy Classic sound with fervor and enhances an already iconic drum. DW's refinements and attention to detail make this unassuming drum one of the crown jewels in the Collectors Series family. Discover what it can do for your sound today. 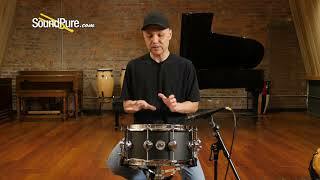 In this video, Sound Pure drums specialist Barry Knain explains the various features of the DW 6.5x14 Black Collectors Solid Aluminum Snare Drum, and tests it out in several different tuning ranges. Cast from heavy-gauge aluminum with an integrated reinforcement hoop, this is not the lightweight aluminum snare from the past. This bright, yet bottom heavy metal drum lacks a lot of the ping and metallic quality associated with brass and steel drums. Finished in a unique wrinkle coating, the drum can be complimented in any of five available drum hardware color options and can be customized with die cast hoops, if so desired.